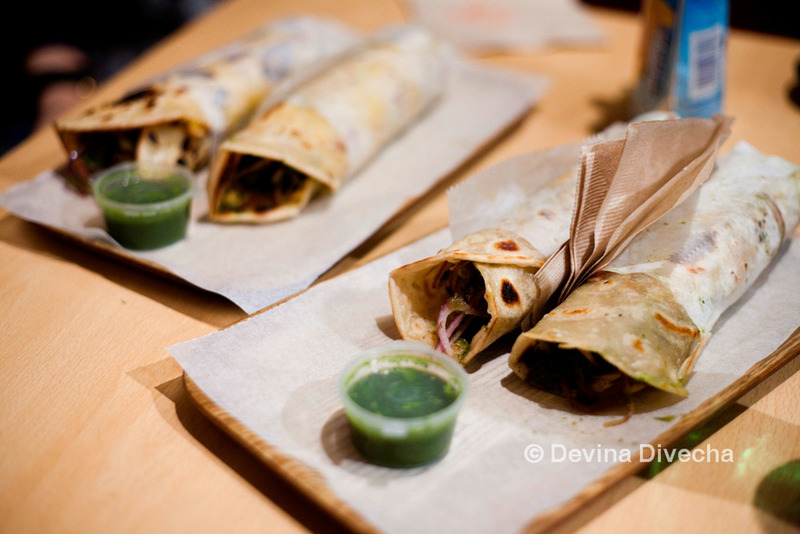 May 15, 2012 February 10, 2013 Devina Divecha9 Comments on Kati rolls so good I ate them for lunch. And dinner. On the same day. Kati rolls so good I ate them for lunch. And dinner. On the same day. 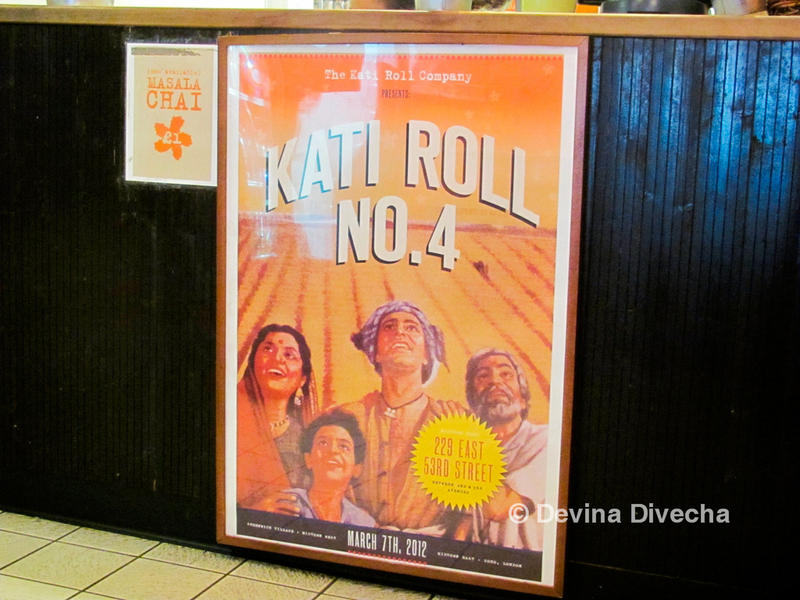 “Do you like kati rolls?” asked my new-found foodie friend Rohit. “Yeah I recently discovered them in Dubai and really liked them!” I said, enthusiastically. 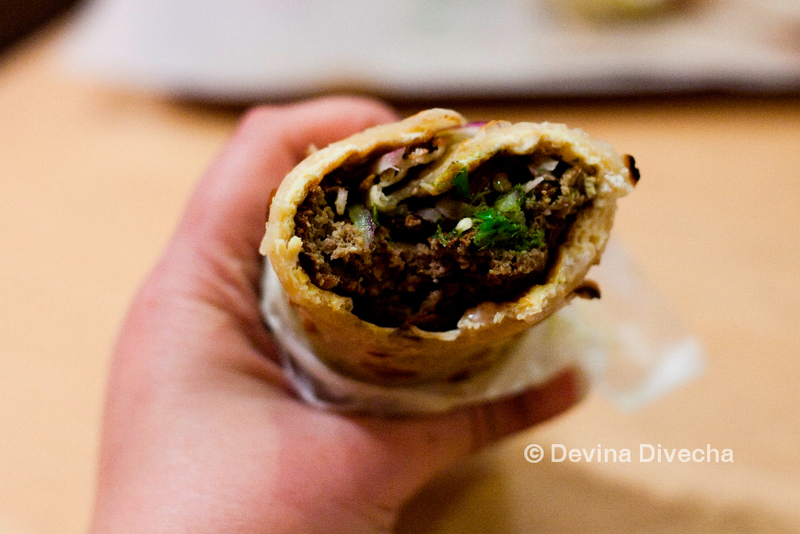 And so he put me on a path that saw me scarfing down kati rolls for lunch, and dinner… on the same day. I met Rohit on Twitter, as one does. I’d been following him for a while and then I DM’d him before my UK trip saying I’d be there in London, would he like to meet up? He said yes. Little did I know that one word would mean a bundle of gastronomic delights for me in London. After hitting one of his recommendations already (blog post on that later), I was inclined to trust his judgement on this one. 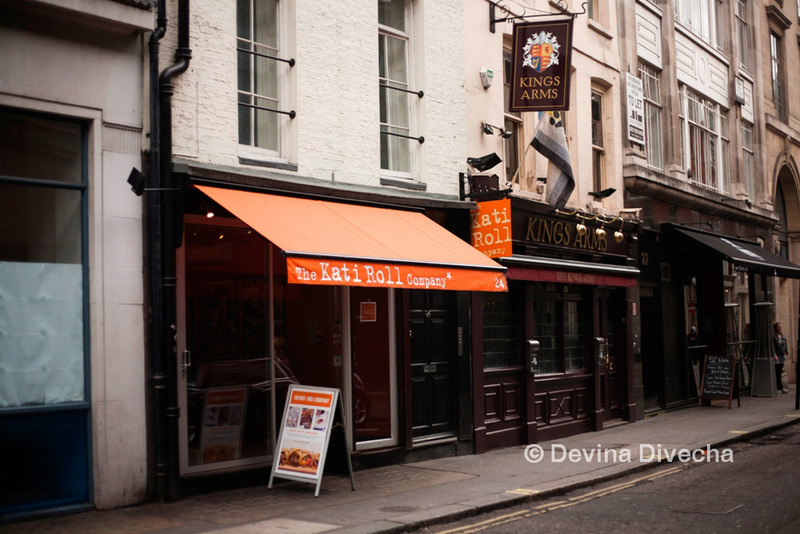 So one afternoon, I got out at Oxford Circus, and tracked down The Kati Roll Company, not 5 minutes away from the Tube station. I’d been expressly told I had to have the shami unda kati roll (minced mutton/lamb and eggs), and that is exactly what I ordered. 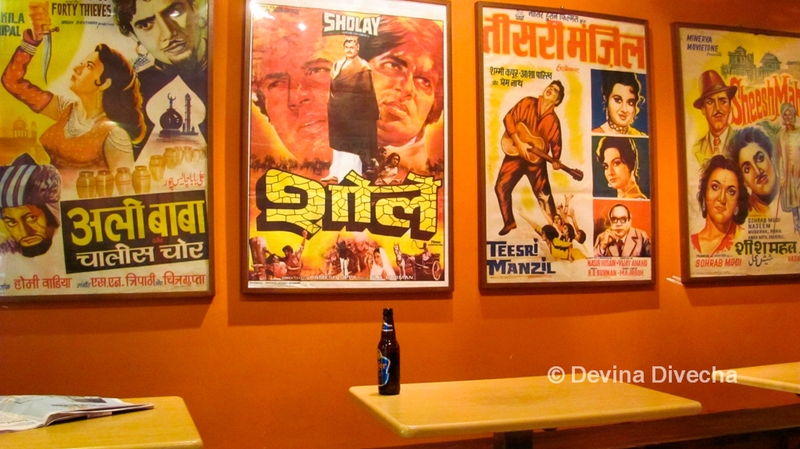 Okay, see that little tub of spicy green chutney that can veritably add that kick to your kati roll? Apparently it got so popular, they’ve stopped giving it with orders…unless you ask for it. This little gem of a foodie tip has been brought to you by none other than Rohit. Bless ‘im. Now as to the actual roll? Heaven. 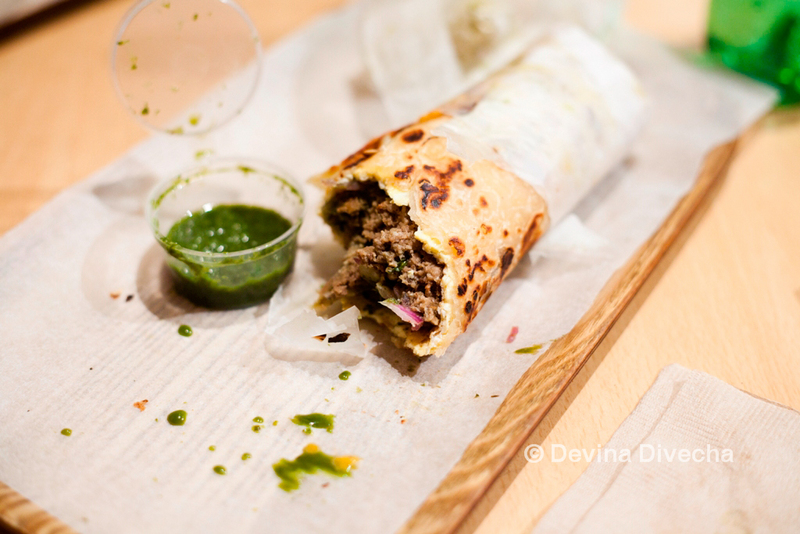 A warm, slightly crispy paratha envelopes the expertly marinaded lamb, that’s mixed with herbs, onions, egg…and then dipped in the spicy chutney. It’s a mini-explosion in your mouth. So I finished my one lone kati roll and left. I kept thinking about it, and thinking some more about it. And I just couldn’t stop. I sent my friend @movie_mafia a message and told her about this place, and would she like to try it out? Tonight? So off we toddled there, just a few hours after I’d already munched one down. They have a deal for when you order two kati rolls of the same type; you can see all the prices (in pounds) towards the end of this post. So we took the unda shami, and the aloo masala kati rolls. The aloo masala was also fine, but considering my carnivore nature, I preferred the unda shami hands down. Halfway through our meal, Rohit joined in. And boy, does he know his food. He did tell us for example, where the name “kati rolls” came from. Apparently ‘kati’ is the word for the sticks or skewers that were used to make the rolls…and so they started being called kati rolls. The restaurant is small-ish; it has a few tables and chairs, but if you go in during rush hour, you’d be hard pressed to find a seat. When I went in the morning, I went quite early, but left around lunch time…and the line was threatening to spill out onto the street. I ended up sharing my table with a lady because there was no other place to sit. The ambience is really cool. 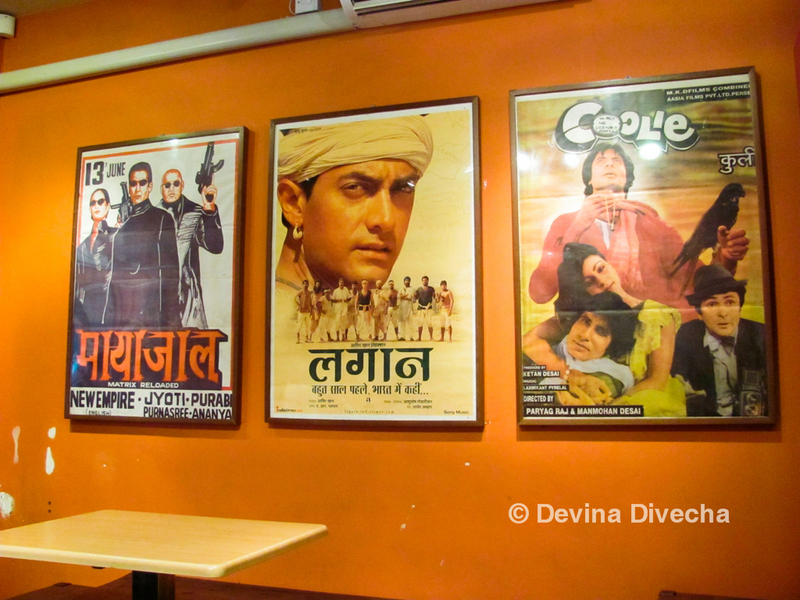 Posters of Indian movies adorn the walls, which are bright orange, contrasting with the brown wooden seating area. Fans I’d expect to see in an old part of some town in India were whirring above my head. 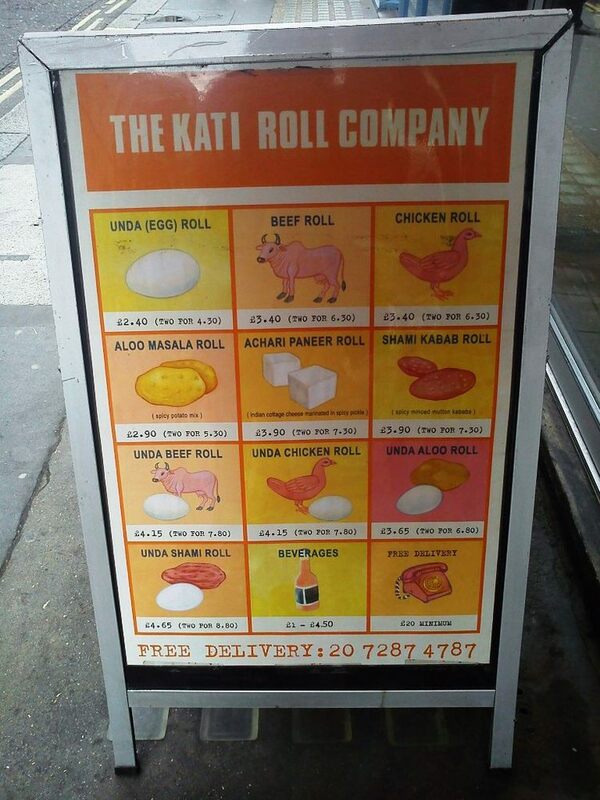 Would I go back to The Kati Roll Company the next time I’m in London? HELL YES. It’s cheap and it’s absolutely thumpingly delicious. And Rohit, a staunch Delhi-ite (and I’m from Bombay…you can imagine how our conversations worked out ;)), swears these kati rolls are exactly like what he has back home. Check out its official website to see its US-based locations and for more information. For some odd reason, I cannot see any text on this post??? Something wrong with my browser i think.. Pics look fab!!! specially the UNDA menu hehehe..lucky u! I want to get in some suitcase and travel soon!!! ah, didn’t know they expanded to London! these guys started out in Greenwich village, NYC…used to be our post-party 2am fix 😉 anda chicken and paneer rolls with an extra squeeze of lemon always won hands down. Well, somehow I am salivating. 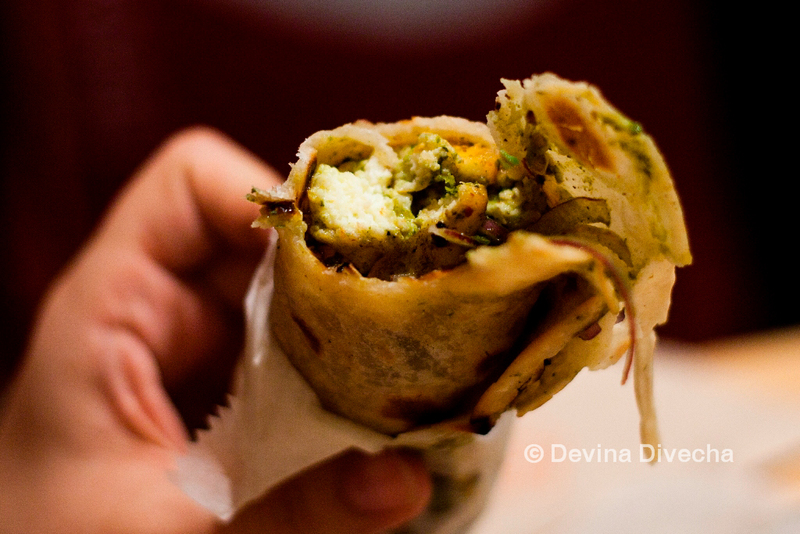 Coming from Kolkata I’m quite a Kati Roll freak. But did you see the cart that illustrating the roll options? This is a ‘new’ to me – seems like a page from the Hindi Alphabet book A for Anda… Haven’t seen such ‘unappetizing’ but realistic illustration ever!My better half is in London right now – have forwarded this post to him. Do you suggest I’ll ask him to pack a few Unda Shami Rolls for me and bring them back to DXB? OMG so late with replying to comments. I’ve been too caught up with work. @inafryingpan – Yeaaahhh I can imagine these being an awesome 2am snack. I mean, look at me…lunch or dinner, I enjoyed it both times. Can’t wait to have it again when I go back! @thirdeyesurfer Dude, you’re like my new London food buddy. We have to hit more places up when I’m back. @IshitaUnblogged – Hahahahahhaa I’m so sorry I didn’t reply earlier. Been super busy. 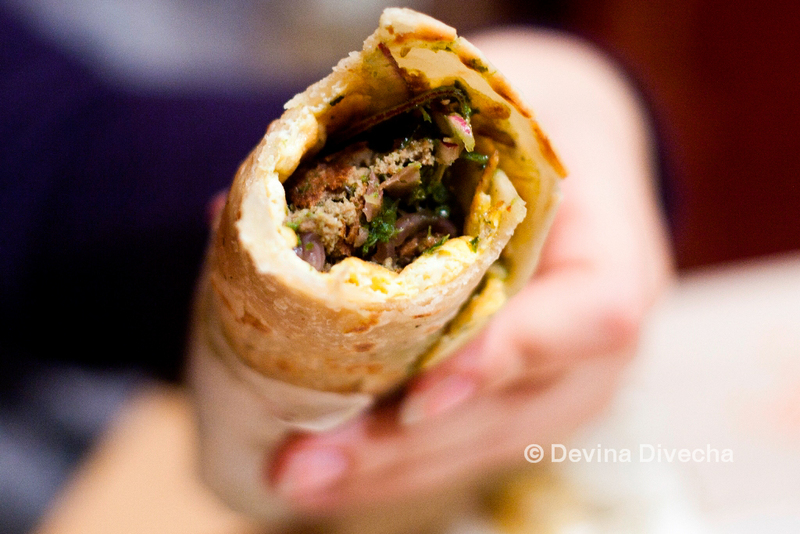 Did you end up getting unda shami rolls packed for you? I don’t know how they’d taste when not fresh though haha. I was tempted to do the same btw…but refrained from the idea! Previous Restaurant disappointment thwarted by Red Panda Brownies.